China Steel, one of the largest steel making plants in Taiwan, relies on Twiflex brakes to provide safe crane control within their vast mill line. The crane trolley and bridge drives, 22 to 90 kW, are also controlled by over 144 of the EMX calipers. They are fitted with electro-magnetic release. This is a good example of the versatility of the EMX type caliper which can be used to cover a wide range of power ratings and provide standardization and cost savings. Supplied through Siemens of Germany, the calipers are installed on a total of 32 cranes. The heaviest of these lifting duties is controlled by means of two off EMX type calipers operating on a disc 910 mm in diameter. The Twiflex MX and MXS pneumatic brake calipers are now recognised as the world’s standard for steel mill braking control. They are installed in mills across the globe, from China to North Yorkshire and from Northern Canada to South Australia. A most recent example is the new Cold Mill at the Port Talbot where over 40 pneumatic disc brake calipers are installed on the Hydrochloric Acid Picking Line, the Continuous Annealing Process Line and the Galvanising Plant. Pneumatic disc brake calipers are chosen for their sensitive and rapid response to air pressure levels making them ideal for tension control applications. Friction pads are secured by quick-release clips, and the brakes have a spring retraction to ensure ample pad clearance when the brake is released. The MX disc brake caliper is a medium duty caliper with a three bolt base mounting which lends itself to mounting calipers back to back in pairs. Based on a well proven 30 year old design, the calipers are of simple, rugged construction and ideally suited for hot and cold rolling and finishing lines. A modern steel plant in the UK invests substantially in being an environmentally friendly producer, an example being the de-sulphurizing unit at their Port Talbot works. Twiflex technology contributes with a system for controlling the winch mechanism needed to raise and lower a ladle hood winch in the BOS plant. 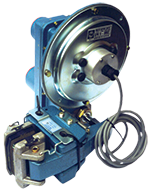 A single, spring applied MXSH type disc brake, released by hydraulic pressure is employed between a motor rated for 55 kW at 1500 RPM and a 112:1 ratio gearbox connected to a winch drum. The winch ropes are drawn over a series of idler pulleys which run down several floors to the main ladle hood. Three Twiflex spring applied type VCS 60 calipers, also released by hydraulic pressure, provide the emergency brake installed on the winch barrel. These also serve to lock and hold the drum when the driving motor is de-energized. The molten iron is transported from the blast furnace to the BOS plant in torpedo ladles pulled by locomotives. It is then poured into ladles and scrap iron and various fluxes are added. The ladles, when full, weigh over 400 tonnes and hold about 300 tonnes of hot metal which is eventually converted to steel. Without these hoods, highly toxic gases would be discharged into the atmosphere. In Scunthorpe, UK is a steel plant that is one of the most modern steel making facilities in the world. It produces good quality steel and therefore requires very accurate blending of its raw materials. The raw materials for steel making (coke, iron, ore and limestone) are stored in bunkers and, when required, are automatically weighed and fed by controlled routes to the ore blending plant. The material is then recovered by one of the two barrel reclaimers which can operate on any one of the four beds. The material collects in the barrel and by rotation is blended before it falls onto a conveyor passing through the barrel. This conveyor then discharges the reclaimed material onto a belt which runs the length of the stockpile area. The prime movers for rotating the barrel are two motors driving through gearboxes to the main drive mechanisms. When stopping these it is important to ensure that the barrel reclaiming buckets are clear of the reclaimed bed area. To ensure this Twiflex EMX calipers are installed between the motors and gearboxes and are applied to give a controlled and accurate stop. The brakes are fail safe and, being spring applied and electrically released, hold the machine when stationary. In this Sinter plant there are over 140 bridge cranes with various control schemes and load ratings. The cast floor cranes are remote or cab control, AC static step-less cranes using wound rotor motors and load brakes or wound rotor pendant control. 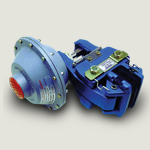 The crane brakes are required to operate in adverse conditions with dust and heat being the main problem. There is little time for routine maintenance and much communication and planning are needed for rare maintenance to be effective. The hoist brakes on the Blast Furnace cranes have been changed to an electrically operated Twiflex EMX brake, which is similar to an automobile disc brake. These brakes have 1.5 times the stopping power of an equivalent drum brake, are self adjusting and produce less heat during stopping. Smaller units can be hand carried for crane installation and easily replace drum brakes; very few modifications are needed. The EMX brakes do not have air gaps or basic lubrication and application times range from 0.15 to 0.4 seconds. Release times are 0.1 to 0.2 seconds. Since the installation, calls on hoist brake related problems have been reduced and plans to convert all drum brakes to Twiflex EMX brakes are in place.